Coimbra, situated about 200 km north of Lisbon and about 115 km south of Porto, is one of the most beautiful cities of Portugal. This site is dedicated to the small tramway system of Coimbra which existed until 1980. The menu on the left links to pages with data about the rolling stock and network development. 17 September 1874 Opening of the first mule tramline by the Rail-Road Coimbricense between Estação Velha (Coimbra-B railway station) and Rua Ferreira Borges. The line was soon extended to Largo da Portagem. 1435 mm gauge. 1885 Closure of the first mule tramline. The exact date is not known. 1 January 1904 Opening of the second mule tram system by the Companhia Carris de Ferro de Coimbra with the same route as the first. 900 mm gauge. A second line from Praça 8 de Maio to Universidade was opened on 4 February 1904. 1908 Revoking of the concession of the Companhia Carris de Ferro de Coimbra. The exact date of closure of the mule tramsystem is not known. 1 January 1911 Inauguration of the electric tramsystem with three routes. 1000 mm gauge. Depot in Rua Alegria. 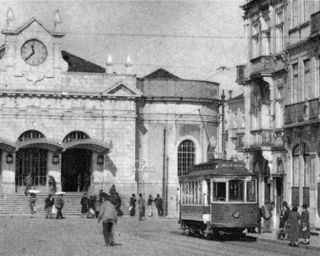 1926 Opening of the second depot in Rua da Sofia. 1928-1929 Extension of the network to six routes. 1947 Introduction of the first trolleybusline on a route not worked by trams before. 10 March 1951 Replacement of the first tramline (5) by trolleybuses. September 1972 Closure of the depot Rua da Sofia. 9 February 1980 Closure of the last remaining tramlines 3 & 4. Replacement by trolleybuses. This site is made by Pedro Rodrigues Costa (historical research) and Ernst Kers (text, design & webmaster). Another source are the books "The Tramways of Portugal" written by John Price & Brian King and published by the LRTA. (1st edition 1964, 2nd edition 1972, 3rd edition 1983, 4th edition 1995) Many of the photos used on this site are from the collection of Pedro Costa or down-sized JPEG files from CD#37 of www.tramway.com.